Somehow it’s already been a two year run of Bubblin monthlies! From it’s first event in April 2010 with the West Coast debut of UK Funky pioneer Roska, Bubblin has seen a great run of singular bookings and dance parties. We’ve been honored to host many memorable events that saw the Pac NW debuts of trailblazing artists such as Pearson Sound/Ramadanman, Dave Nada, Kyle Hall, Zed Bias, Nguzunguzu, LOL Boys, Distal, Dubble Dutch, Dre Skull, and numerous others. It’s been really awesome! We’re so thankful to have a pasionate core of amazing people that have been so support both at shows and online. For our two year celebration we’re thrilled to be bringing HxdB back to PDX, who laid down one of the very finest sets we’ve ever heard at a Bubblin in July 2011. HxdB is unquestionably at the forefront of mutant garage/house sounds in the Pac NW, with a huge new release alongside fellow Bubblin alum Distal on iconic UK label Tectonic that is currently blazing up the charts. He always comes well equipped with a slew of unreleased dubs to fuel his impeccable and unfailing DJ taste and timing. We can’t wait to hear what he’s got in store for us! 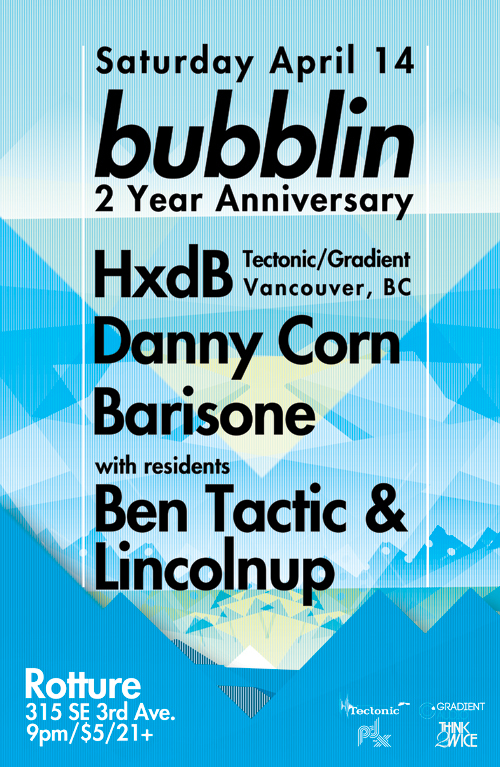 PDX superbadmen Danny Corn and Barisone will be on hand as well, providing stellar local support along with your faithful Bubblin residents Ben Tactic and Lincolnup. -> For over 17 years, Danny Corn has been on the vanguard of electronic music, leaving the trends to other people. As a DJ, he is known as an instrumental player in the formation of the “west coast” sound and over the years has traveled extensively and played with just about everybody who has made moves in the scene. A champion of syncopated, bass heavy music, Danny Corn rides the edge of experimental sounds, whilst staying firmly committed to the dancefloor. A recent move to Portland, OR has found Danny Corn taking time to channel all of his experience into music production. His current sets are a eclectic mix of originals, exclusives and personal favorites. -> Barisone is without a doubt one of PDX’s best loved DJ’s. His magnanimous presence and penchant for putting the dancefloor into sublime outer spaces is well known. With versatile crates that seamlessly span the upfront to the time tested, Barisone comes with dj sets filled with his own loops, layers, and edits that always set the party off. * This will be the final installment of Bubblin’s monthly residence parties. Fret not however, we’ll still be doing one off events to ensure that PDX can get it’s proper fix of upfront house, garage, and tropical bass, beginning with highly regarded DJ and Hessle Audio co-operator Ben UFO (London, UK) at Groove Suite on Sunday, May 20, 2012. This entry was posted on March 21, 2012 at 4:09 pm and is filed under Uncategorized. You can follow any responses to this entry through the RSS 2.0 feed. You can leave a response, or trackback from your own site.